If you’re planning Vacation Bible School this year, take some time to think outside the box. There are many ways to do Vacation Bible School. Don’t limit yourself to what you’ve always done. If you have a children’s ministry team, have a meeting with them to come up with new ideas. If you don’t, you might want to put together a dream team made up of workers, parents, and church leaders to dream up big ideas. You don’t have to use all of these ideas, but they will spark other ideas that you might be able to use. 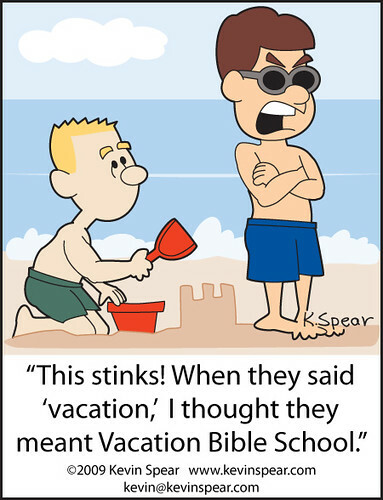 Today, I’m listing some, but not all, of the ways you can have Vacation Bible School. Traditional Morning or Evening Model: Traditional VBS consists of having an opening and closing session, and having a VBS teacher for each age group. Rotation Model: This model is used in Group Publishing VBS. Each leader takes one group to each station. One station may have the Bible story, another craft, another snacks, and another music. Each station has a leader that only does that station for each group. Groups can be split into age groups, or they can be mixed. Vacation Bible Crusade Model: This model of VBS uses the format of a Kid’s Crusade for the first hour. The music, Bible story, life application, memory verse, and other teaching activities are all done during the crusade. For the second hour, children are rotated. They have crafts with the craft leader for a half hour, games with the game leader for fifteen minutes, and class time with their group leader for fifteen minutes. Class time consists of attendance, snack, and reviewing the memory verse and lesson for the day. If you have a strong leader to direct the Kid’s Crusade, this model is easy and uses fewer workers. Backyard VBS: This is a neighborhood model where people open their homes to allow a small group of children to come and have VBS. This is a great model for outreach. It works even better if you have bus or van ministry to transport the children to church after VBS, or if you plan on having a Sidewalk Sunday School or neighborhood Bible Club to continue to minister to the children after VBS. Follow Up: Whatever method you decide to use, don’t forget to plan a big follow-up event. You could have a carnival, a fun Sunday, or a party. Don’t let children who came to VBS, got saved, and don’t have a church they attend regularly fall through the cracks after VBS is over. This entry was posted in Children's Events, Outreach, VBS and tagged vacation Bible school, VBS, VBS Models. Bookmark the permalink.